The Jewish Foundation for Jewish Studies had decided to change their name and logo; of course, they needed to update their website as well. They came to us with a very short production time: two weeks! Thanks to their excellent response times, and our use of the Pastel framework (for website QA testing), we were able to meet their tight deadline. 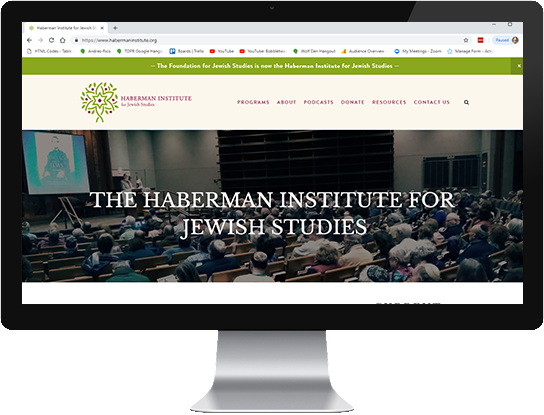 The newly-renamed Haberman Institute is a hub for sponsored events, speeches, and classes on Jewish studies. They wanted their website to house event details and registration links for all their offerings, and we were happy to oblige. We kept using their online registration system, and populated a calendar with events and classes, making everything easy to find. We also linked to their pre-existing extensive library of podcasts, with the intent of integrating the collection into the website in the future. The end result is a cleaner, leaner, and more attractive central hub where visitors can easily find what they are looking for.